Chancellor, Vice-Chancellor, honoured guests, Aston Graduates, Ladies and Gentlemen. I want to thank the University for conferring this honour on me. My grandparents left India to pursue better lives in the 1920s, where they helped build the Railways in East Africa. Both regions were colonies of the British Raj. My father and his siblings were born in East Africa too, as were a number of my generation. As is well documented, political circumstances in these countries changed for the worse and in cases like that of Uganda, the Asian community had to flee, literally, overnight. In Kenya, the situation wasn’t as pronounced but as they had done once, my family decided to move for better prospects of their future generations. We arrived in London in the early 80s. Soon after arriving, my father passed away. I was very young. My mother, a young 40 year old, raised my sister and I with the support of a loving extended family. With her world having fallen around her, she continued through her life, in what can only be considered a spectacular success. She worked two jobs at times to ensure we were provided for. She worked in a samosa shop, she worked in a photo processing plant, she worked in an old people’s home, and the reason she went on to explain to us was simply that she wanted us to live a better life. One day, I remember this vividly, when I had to choose my GCSE options at the age of 14, she said something that has stayed with me since. She said: “all I want you to do is to get to university, because everyone around you who has, seems to have done well for themselves”. I accepted her reasoning. 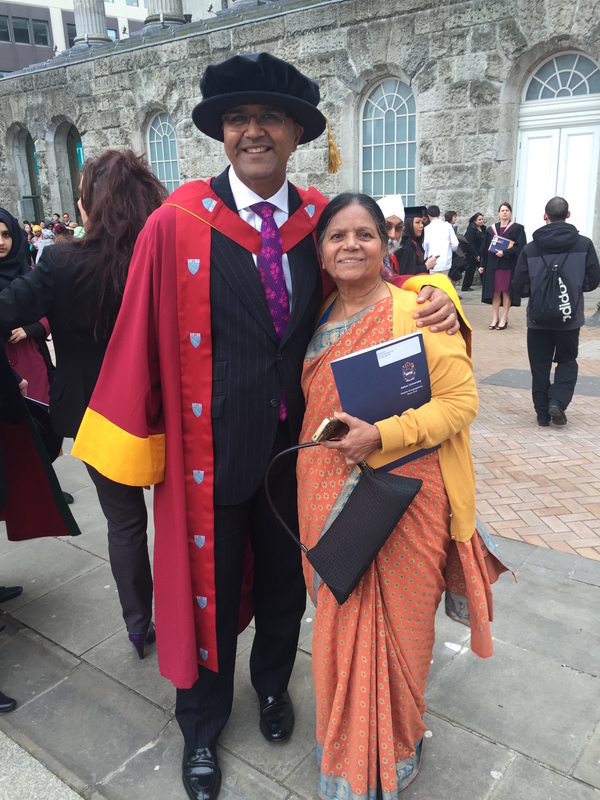 It is this commitment to education that has resulted in, today, this Honorary Degree being conferred on me. We live in an age which is increasingly being referred to as the Fourth Industrial Revolution, one which is characterized by robotics, artificial intelligence, autonomous transport, advanced bio-technology and genomics, and the fundamental question that is being asked is whether universities can keep pace and remain relevant in a reality that is moving at warp speed. Well, let’s take a look at a survey conducted by the World Economic Forum’s Global Agenda Council on the Future of Jobs, which I am a member of, that asked Chief Human Resource & Strategy Officers of major companies about their employment, skills and workforce strategy for the future. They were specifically asked what the current shifts mean to our world order. It is about all of the above, and more, but more than ever, my experience tells me that it is a bias for action – making things happen that trumps them all. Furthermore, you are the most connected generation ever, and I think success will come to those who are able to join up the dots, and give meaning to situations that just don’t normally add up. Together, your generation – more than any previous generation, can go out and make anything happen. You can change the world. So, how do universities remain relevant? Well, the answer lies within my story. Whilst, I gained an academic degree from Aston, what I truly gained was an understanding of people. Moving to Aston Triangle and Birmingham provided me with my first independent opportunities to learn from others with many different viewpoints and backgrounds. By embracing all aspects of life here, I became a confident person. By holding roles in societies, I learnt new skills, by living with others – like my two friends who have joined me here, I learnt the meaning of friendship. Through time, we have relied on each other, pushed each other, helped each other and, yes, learnt from each other. Together we’re stronger. And I continue to learn from people all over the world all the time. My education goes on and on. Friends and honoured guests – long after you have left the corridors and lecture halls of Aston, it is the people you meet that will help you build a bridge from the present to the future. That is the most important education I have received. I had the fortune of meeting Aung San Suu Kyi after she was released from house arrest, where she explained that the need of the hour in her country’s education system was to ensure that children knew how to work better in teams. How to relate to other people is the key. These “21st century skills” apply more so in building equitable and peaceful societies and I gained these and more at Aston and this is why universities will continue to be cherished and remain relevant. I ask each and everyone of you to take this simple lesson to heart. It can make the biggest difference to your life. Friends, Aston was important to me. I see the education I received as being broader than just the degree I received over here. Aston gave me my first taste of being an adult, and in many ways it gave me wings, which have taken me to so many places in the world, where I have had the fortune of meeting remarkable people who are doing spectacular things to make the world a better place. For this I thank the University. I end with a message to my two daughters who accompany me here. My wife and I are immensely proud of them. But in the end I ask them to take away one thing from today… the words from my mother, their grandmother.